The Supreme People's Court is the highest level of court in the mainland area of the People's Republic of China. Hong Kong and Macau, as special administrative regions, have their own separate judicial systems based on British common law traditions and Portuguese civil-law traditions respectively, and are out of the jurisdiction of the Supreme People's Court. The Supreme People's Procuratorate also translated as the "Prosecutor General's Office" is the highest national level agency responsible for both prosecution and investigation in the People's Republic of China. Hong Kong and Macau, as special administrative regions, have their own separate legal systems, based on common law traditions and Portuguese legal traditions respectively, and are out of the jurisdiction of the SPP. Shanxi is a province of the People's Republic of China, located in the North China region. Its one-character abbreviation is "晋", after the state of Jin that existed here during the Spring and Autumn period. The Constitution of the People's Republic of China is nominally the supreme law within the People's Republic of China. 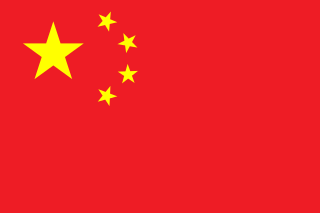 The current version was adopted by the 5th National People's Congress on December 4, 1982, with further revisions in 1988, 1993, 1999, 2004 and 2018. Three previous state constitutions—those of 1954, 1975, and 1978—were superseded in turn. Zhao Hongzhu is a retired Chinese politician and previously a member of the Communist Party of China's national leadership. Zhao served as the Deputy Secretary of the Central Commission for Discipline Inspection (CCDI), the Communist Party's anti-corruption agency, as well as a Secretary of the Central Secretariat. Su Shulin is a Chinese oil and gas executive and former politician. Between 2011 and 2015, he served as Governor of Fujian province, on China's eastern coast. Before beginning his political career, Su served as the Vice-President in the state-owned PetroChina Company Limited. He later became chief executive of Sinopec Group. In 2011, Su was named Governor of Fujian. He was investigated by the Central Commission for Discipline Inspection in 2015 and subsequently expelled from the Communist Party of China for violating organizational discipline. He was sentenced to sixteen years in prison upon being convicted on charges of bribery and abuse of power. Liang Bin is a former Chinese politician from Shanxi province. He spent most of his career working in his home province, successively serving as the Party Secretary of the cities of Shuozhou and Xinzhou, before being transferred to Hebei province in June 2008 to head the party's provincial Organization Department. Liang was investigated by the Communist Party of China's anti-graft agency in November 2014. A far-reaching campaign against corruption began in China following the conclusion of the 18th National Congress of the Communist Party of China in 2012. The campaign, carried out under the aegis of Xi Jinping, General Secretary of the Communist Party of China, was the largest organized anti-graft effort in the history of Communist rule in China. Yang Xiaodu is a Chinese politician, the Director of the National Supervisory Commission, and a member of the Politburo of the Communist Party of China. He has served in Shanghai and Tibet during his early political career. Since 2014, he has also been a Deputy Secretary of the Central Commission for Discipline Inspection (CCDI), the leading anti-graft body of the Communist Party of China. Yao Gang is a Chinese executive who served as one of four Vice-Chairmen at the China Securities Regulatory Commission (CSRC), China’s top security regulator. He was investigated by the Communist Party of China's anti-graft agency in November 2015, after a stock market rout rocked global markets. Yao's downfall marked the widened government crackdown on corruption in the financial industry. Zhang Yujun (张育军), former assistant chairman of the CSRC, was placed under investigation in the end of 2015. Su Hongzhang is a former Chinese politician, and Secretary of the Political and Legal Affairs Commission of Liaoning Province. He was dismissed from his position in April 2016 for investigation by the Central Commission for Discipline Inspection. The 19th National Congress of the Communist Party of China was held at the Great Hall of the People, Beijing, between 18 and 24 October 2017. 2,280 delegates represented the party's estimated 89 million members. Preparations for the 19th National Congress began in 2016 and ended with a plenary session of the Central Committee a few days prior to the Congress. In 2016, local and provincial party organizations began electing delegates to the congress as well as receiving and amending party documents. Yao Zhongmin is a Chinese economist who served as chairman of the board of supervisors at China Development Bank (CDB) from 2008 to 2013. He had also served as deputy chief of the Communist Party of China (CPC) committee at the CDB and vice governor of the bank. In June 2016 he was put under investigation for alleged "serious violations of discipline" by the Central Commission for Discipline Inspection (CCDI). He was soon removed from membership of the Chinese People's Political Consultative Conference. In September 2016 he had been expelled from the Communist Party of China and removed from public office. In October 2016 the Supreme People's Procuratorate announced that authorities were investigating accusations of corruption against him. In August 2017, he was sentenced to 14 years for accepting bribes by the Intermediate People's Court of Baoding City. Li Jianbo is a Chinese politician. At the height of his career, he served as a member of the Central Commission for Discipline Inspection (CCDI), the party's highest internal-control institution. He was removed from membership of the CCDI in January 2017. Pu Bo is a former Chinese politician who served as Vice Governor of Guizhou. He was dismissed from his position in May 2018 and placed under investigation by the Central Commission for Discipline Inspection and the National Supervisory Commission. Zeng Zhiquan is a former Chinese politician who served as the Head of the United Front Work Department of the CPC Guangdong Committee. He was dismissed from his position in July 2018 and placed under investigation by the Central Commission for Discipline Inspection and the National Supervisory Commission. Li Shixiang is a former Chinese politician who spent most of his career in Beijing. He served as Executive Vice Mayor of Beijing and Vice Chairman of the Beijing Municipal Committee of the Chinese People's Political Consultative Conference (CPPCC). In September 2018, he was placed under investigation by the Central Commission for Discipline Inspection (CCDI), the Communist Party's internal disciplinary body, and the National Supervisory Commission, the highest anti-corruption agency of China. Jin Suidong is a former Chinese politician who spent most of his career in north China's Henan province. 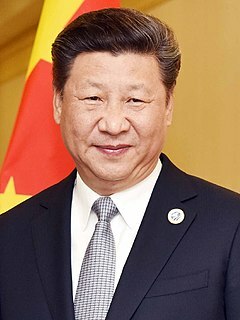 On September 18, 2018, he has been placed under investigation as President Xi Jinping's continues an anti-graft dragnet at all levels of government, military and ruling Communist Party. Qian Yin'an is a Chinese politician who spent his entirely career in his home-province Shaanxi. He entered the workforce in August 1983, and joined the Communist Party of China in March 1987. He was investigated by the Communist Party of China's anti-graft agency in November 2018. Previously he served as Secretary General of the CPC Shaanxi Provincial Committee. He is the second Standing Committee member of the CPC Provincial Committee caught after the 19th National Congress of the Communist Party of China. ↑ "People's Republic of China Supervision Law (draft)". China Law Translate. China. 6 November 2017. Retrieved 27 January 2018. ↑ "Why should the National Supervisory Commission merges its operations with the Central Commission for Discipline Inspection of CPC?(为什么中央纪委与国家监察委员会要合署办公？)". Website of CCDI & NSC. China. 2 Feb 2018. Retrieved 2 April 2018. ↑ "China to set up national supervision commission next year". Xinhua News Agency. 2017-10-30. ↑ "Anti-graft campaign to broaden". The Standard . 2017-11-06. 1 2 3 4 Deng, Jinting (March 2018). "The National Supervision Commission: A New Anti-corruption Model in China". International Journal of Law, Crime and Justice. 52: 58–73. doi:10.1016/j.ijlcj.2017.09.005. ↑ "CPC proposes listing supervisory commissions as state organs in Constitution". www.xinhuanet.com. Xinhua. 2018-02-25. Retrieved 2018-02-25.